1. 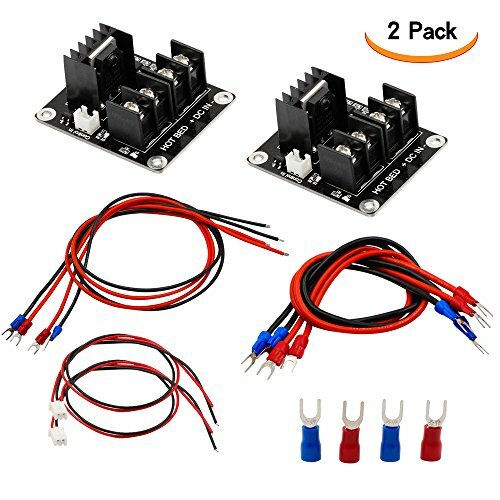 If you intend to use heated bed with your 3D printer that uses a 12V(15A current) power supply, then this module is recommended, else it may cause excessive current during times which may burn the connectors on the controller board. 2. Another saying, If you need anything greater or equal to 15A this module is a must! For example, if your total power usage is 240W and you have 12V power supply, then it means at least 20A current is needed (20X12=240W). As ChiTu controller board is only capable of 15A this setting will not work. To make it work, you need this extra power module. 3. With this addon module to your 3D printer motherboard you can lead the maximum current up to 25A. Dimensions(LxWxH): 6 x 5 x 3 cm/ 2.4" x 2" x 1.2"
Heat bed Mosfet: apply to solve the problem of hot bed's large power and the load current, can work well with the Anet A8. General motherboard's Maximum current is 15A, this add-on Mos module to board lead the maximun current up to 25A. Please Kindly Note: under the premise of normal cooling, it work stable under I(Max)=25A, so we suggest the current must not exceed 25A while the process working. The hot bed module can be used in both Chitu motherboard and other open 3D printer motherboards. Wire is 14AWG and 30-60 cm length, each module has done functional test before shipment, anyone receives a defective one please contact us, we will give you support within 24 hours.